CarPro FlyBy30 Windshield & Glass Coating Kit will protect your windshield from everyday contamination, along with adding an extreme level of water repellency. Snow, salt, rain, bugs, and anything else mother nature has in her bag of tricks is no match for FlyBy. This glass coating is UV stable, has a high chemical resistance, and will provide resistance to scratches and minor chips. Snow and rain will slide off the glass easier than before, allow for easier cleaning, and much better visibility when driving. FlyBy will bond to the surface, which allows for no chattering of the wiper blades when in use. Just like the contamination, the wipers will glide over the surface with ease! Best yet, FlyBy will last up to two years on your windshield and possibly longer on your other windows. 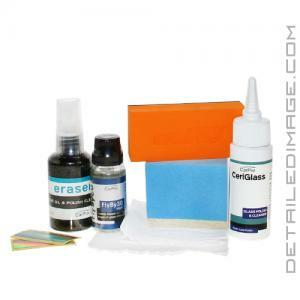 If you are looking to protect your glass surfaces, the CarPro FlyBy30 Windshield & Glass Coating Kit is a great choice! Apply in circular motion in an organized pattern across the glass and do not wipe off. It will flash nearly invisible as you apply. Using the same applicator (but no additional Forte) once again repeat step 4 buffing off any trace of residue until the surface is 100% transparent and clear. For side windows only 1 layer is needed. Keep surface dry for 4 hours with no wiper blades for 24 hours. I purchased two kits. I was able to get almost 3 vehicles out of a single coating bottle, and still have a decent amount of Ceriglass left from the first kit. I had to open the second package to finish out the three coats on the front windshield of the third vehicle though, but I've been really pleased with the results. Water effortlessly beads and flies past on my windshield. I top this with Reload to hopefully help make it last a little longer too, in case that matters. The only thing that I dislike is that the glass seems almost coarse when drying with a microfiber towel, so I tend to get some lint on the windows even though the towels don't have lint issues anywhere else. It's happening on all three vehicles, so I'm guessing that's normal. Application was a breeze and looks great. Calling for rain tomorrow so we'll see how it works. Package did not contain what the package list indicates. It has two cotton applicators instead of five, and it has two foam applicator blocks that are very different, but there is nothing indicating which one is used for which step. From what I've read, the CeriGlass Polish is a pain to use; I wish I had researched it further before purchasing this kit. I'll test it out and hope for the best!